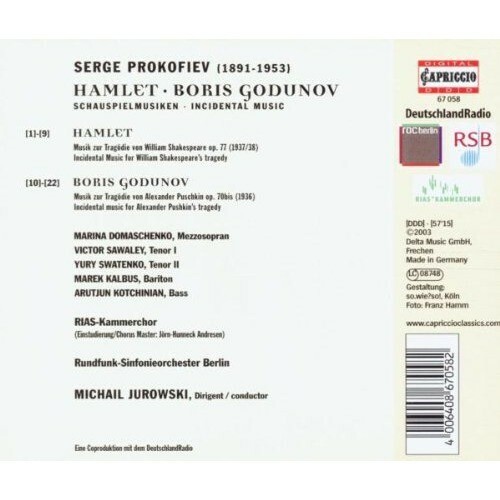 Jurowski continues his adventurous tour through lesser-known Prokofiev with what may well be the first complete recording of the extant incidental music for Boris Godunov. Like Prokofiev's music for Eugene Onegin and Queen of Spades, the Boris project originated with the 1936 Pushkin centennial; and like its siblings, it remained unperformed until well after his death. Not surprisingly, there are certain ambiguities in the published score and its realization here. The printed instrumentation list, for instance, calls for a mixed choir—but in what actually follows, only the men are called upon to sing. More puzzling, Igor Kazenin's notes insist that Prokofiev intended the three monolithic choruses of the People to be sung without accompaniment and that this recording thus eschews the Tishchenko orchestrations included in the 1973 score; in fact, however, the instrumental parts are included. Whatever the lingering puzzles, however, some of the music is fascinating indeed. Most immediately arresting is the battle music, in which three different instrumental groups in three different styles (“German,” “European,” and “Asiatic,” as the score quaintly puts it) alternate and overlap in a free-for-all among competing keys and tempos (Jurowski's son Dimitri helps out in the conducting here). Besides Prokofiev at his most Ivesian, you can also hear Prokofiev at his most minimalist in the spare, unaccompanied duets for Missail and Varlaam. There are plenty of other attractive bits, too: a snappy Scherzando, for instance, a lyrical Amoroso, and (more beguiling yet) a brief song for Ksenia with a delicate accompaniment for six solo strings. In the end, perhaps, it remains a lesser work, but Prokofiev's admirers will be glad to have a chance to hear it. The recording is more complete, more true to the score, and more skillfully interpreted, than the dreary Alexander Frolov abridgment documented on Consonance. That said, it's not hard to imagine even punchier performances than Jurowski's: more alert woodwinds, for instance (they're especially disappointing as the material is bounced around in the Polonaise), defter rhythms (the Mazurka is slightly heavy-handed), a sharper sense of Prokofiev's irony (the Scherzando needs more bite). 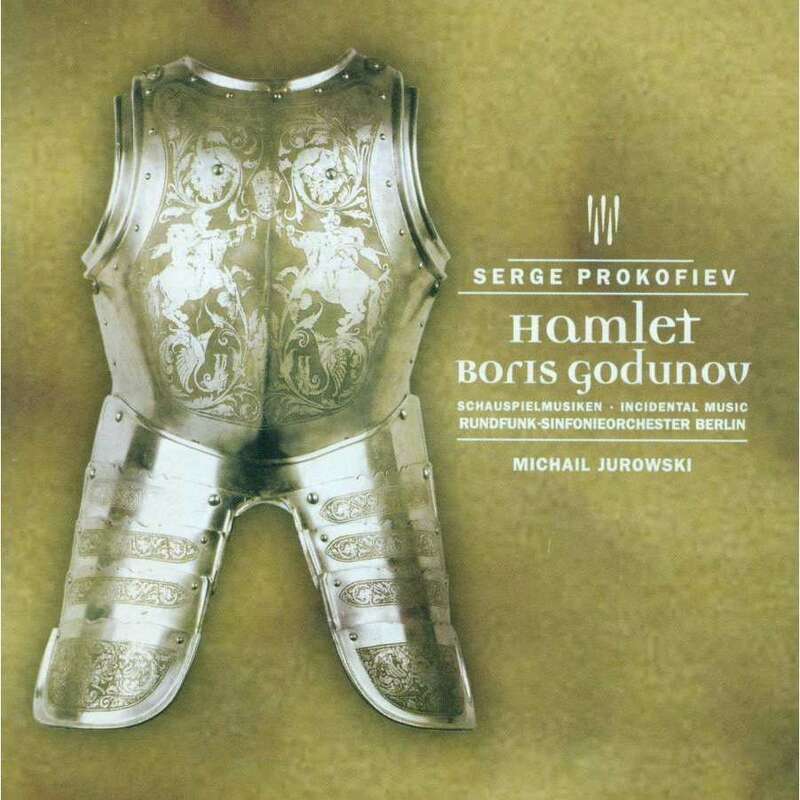 The same interpretive grayness clouds the orchestral contribution in the more familiar music for Hamlet (balances are sometimes haphazard, brass sometimes seem timid)—although much of the music's anxiety (especially in the opening movement) comes across anyway. Both singers, fortunately, have a strong sense of the rhetorical function of their brief songs. Decent sound; slightly hard-to-follow notes. All in all, recommended for connoisseurs.